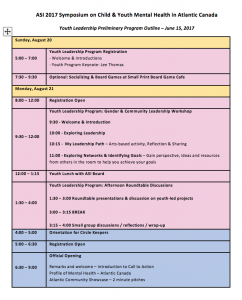 The Youth Leadership Program is a priority of the Atlantic Summer Institute on Healthy and Safe Communities (ASI) given its theme of Promoting Child and Youth Mental Health: Moving Evidence to Action. The program will build on lessons learned from previous ASI programs and will provide an opportunity for young people to attend and have a voice in shaping the future agenda for children and youth in Atlantic Canada. ASI has learned from previous events how important it is to foster intergenerational learning. During ASI 2017, there will be time for youth to both participate in the full program and convene separately to develop long lasting connections. ASI 2017 will support at least five youth from each Atlantic province to come together in Charlottetown for this event. Young people between the ages of 18 and 25 who are affiliated with a community group and have experience or are interested in being an advocate or leader are encouraged to apply. Exceptions to the age limit may be made for young people who fit all other criteria. The program will be planned with input from youth leaders who attended the 2016 Institute and will extend over 3.5 days (August 20-23). An orientation for youth delegates will be held in the evening of August 20th with a full day of youth leadership programming on August 21. To create space for a youth voice during the full ASI program, Learning Circles will continue; and a “lunch with speakers” opportunity has been added to this year’s program. Youth, along with other participants will contribute to the Call to Action during the event. Invitations will be extended through our partner organizations. An ASI Youth Leadership Coordinator will liaise with organizations and provide planning and oversight to the Youth Leadership Program. For more information, phone 902-894-3399 or contact the Youth Leadership Coordinator, Megan Stewart, at megan@thequaich.pe.ca.